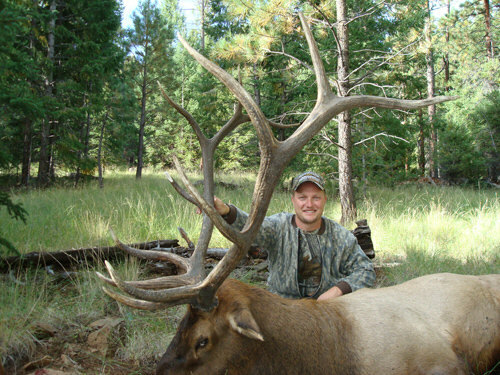 Arizona has some of the best elk hunting in the world and can be considered the top producer for record-class bulls! We offer a few great hunting options for all elk enthusiasts from early rut hunts, archery hunts, late firearms bull elk hunts, muzzleloader elk hunts and even cow elk hunts. The most popular elk hunting timeframe is during the rutting season when bulls and cows are vocal. We conduct an archery rut hunt and an early firearms rut hunt. Hunting elk during the rut usually means getting into love-crazed bulls that bugle their heads off! Mid-September through the beginning of October hits the main part of the rut, so there is usually nonstop action on these hunts. The early firearms/muzzleloader hunt follows the archery hunt and, again, there is usually a lot of action! Bulls can fall victim to a call during this timeframe. Nothing gets the blood pumping more than hearing a monster bull elk answer your calls and come crashing in straight for you! Your guide will often use a bugle or cow call for trying to coax a bull elk to within shooting distance. Our archery and early muzzleloader or early rifle elk hunts are conducted mostly in higher timber elevations of 7500 to 9500 ft. Even though hunting is done in September and October, the weather during these hunts are very enjoyable. It can range from 65-75 degrees in the day to 30-40 degrees at night. Complimentary accommodations are in tent camps or camping trailer, depending upon the number of hunters in camp and feasibility. The camp and the hunt area is accessed by four-wheel drive trucks. The actual hunting is done on foot in mountainous terrain, so hunters should be prepared. Hunters are encouraged to condition themselves to the best of their ability in order to increase their odds for success. If you are looking for a horseback hunt, this is NOT the hunt for you. These three early hunts are placed during the rut to post-rut (when elk are vocal). Arizona elk hunting is on a limited draw basis. Hunters must apply in January-February. The archery bull season is averaging 5 tries before the hunter draws. Some lucky guys are drawn for archery bull their first try, while others might take longer than 5. The key is to keep applying until drawn. The rut firearms tags are very high in demand and harder to draw than all the other elk hunts. But, if you draw the firearms rut tag, it is usually worth the wait. Keep in mind that Non-Residents who do not have max points (around 24) have only a slim chance at ever drawing the RUT firearms tag. 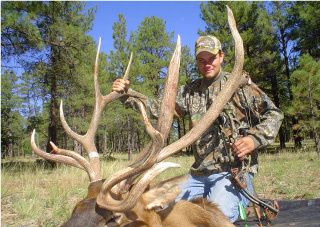 We suggest that nonresidents who want to hunt Arizona bull elk within the next couple decades, try to draw a more attainable tag, such as archery or late muzzleloader or late firearms. We will help our potential clients with the lottery drawing process which takes place in January-February. 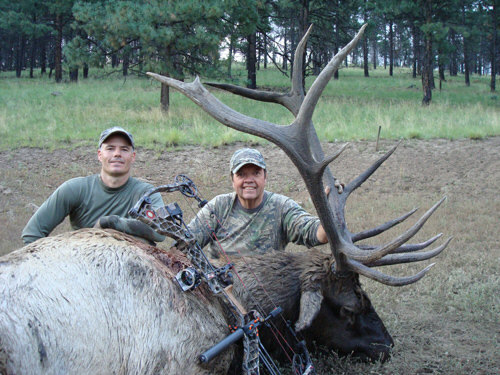 Our rut archery bull elk hunters have typically experienced 100% Rate of Opportunity! Our past RUT early season firearms/muzzleloader hunters have experienced a 100% Success Rate with many of those rut firearms bulls scoring 350" or more! 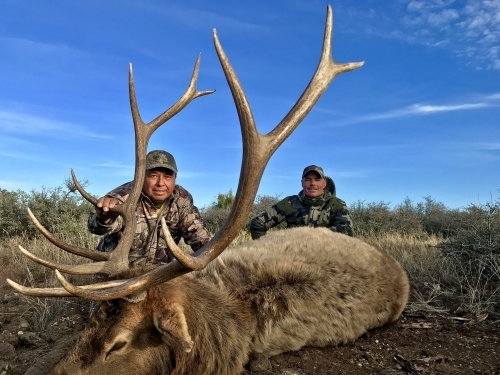 The Arizona late firearms bull seasons have the best odds of drawing a tag. Since elk are migratory animals, cold weather combined with frost or snow usually drives the herds off the high mountaintops so they can access the more palatable foods. This often brings them into fairly open terrain with sparse trees and junipers. Mature bulls segregate themselves from the cows during this time of the year and can often be seen in bachelor groups. Since elk are not vocal during this period, glassing vast distances from a high vantage point is our main technique for the late season. Once a good bull is spotted, we get within shooting range. Expect long shots in this fairly open terrain. If it snows in the high country just prior to season and the weather cooperates, we can see an abundance of bulls on our 6-day late hunt in Arizona. Therefore, this hunt usually has very high opportunity of obtaining a trophy. If it doesn't snow in the high country or it is dry with higher temps than normal, there is still the chance for a good bull. It only means we must be persistent and hunt harder. As with our other elk seasons, hunting is done on foot. Hunters are encouraged to condition themselves to the best of their ability in order to increase their odds for success. If you are looking for a horseback hunt, this is NOT the hunt for you. The weather during the late elk hunt can range from to 5-20 degrees at night to 40-50 degrees in the day. Snow is possible. Complimentary accommodations for fully-guided hunts are in heated canvas tents with padded cots. Late Bull Elk tags are also by draw in January-February. It is a much easier draw than the rut firearms bull season, but our hunters are averaging 6 attempts before they draw a late bull elk tag. Some lucky hunters are drawn their first try, while unlucky applicants might take longer than 6. It's a random draw system, so the key is to keep applying until drawn. We will assist with the drawing process and where to apply. 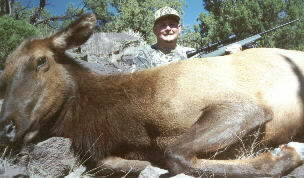 The Arizona Elk draw period is late January-February. Our late firearms bull elk hunts consist of a late muzzleloader season and a late rifle season. Arizona Muzzleloaders can be modern "inline style" and use scopes and sabots. The late muzzleloader season has the highest odds of drawing a tag. Late bull elk hunts have a high rate of opportunity for taking shots. We also offer antlerless elk hunts. Even though they have no antlers, cow elk are a blast to hunt! A big cow can weigh as much as 500 pounds on the hoof and produce excellent table fare. The spot and stalk method is mainly used on our cow hunts, so the actual hunting is done mostly on foot. Expect long shots, since we hunt fairly open country. Recommended rifle calibers for cow elk are the .270 to .300 magnums with a good variable power scope. Muzzleloaders should be modern inline style with scopes and can use sabots. Accommodations are in tent camps. Hunters should condition themselves for mountain terrain in order to increase their odds for success. If you are looking for a horseback hunt, this is NOT the hunt for you. We tyically conduct an October rifle cow hunt in the higher timber areas of Arizona. We also conduct a November muzzleloader cow elk hunt and sometimes a December rifle hunt in the lower migration areas. Our cow hunts have a 100% rate of opportunity (getting shots). Like all Arizona elk hunting, Cow elk tags are also by draw in January-February. It is a much easier draw than bull elk tags, but it is averaging three tries to draw a cow tag. Some are drawn their first try, while others take longer. We will assist interested hunters with the application process so that you are drawn in the correct areas. 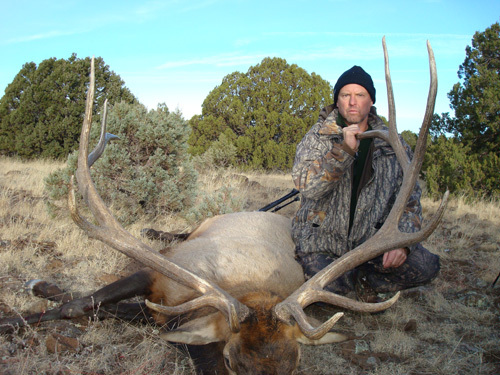 Typically, we apply to Arizona unit 1 and unit 6a for cow elk hunts. Hunting license fee: $160.00, Tag fee if drawn (Non-Res): $665.00. ALL OF OUR ARIZONA ELK HUNTING IS BY DRAW. The State of Arizona does not offer a landowner tag program. The Elk drawing online application starts in mid January with a deadline in early February. The applications for Arizona Elk are accepted Online at the AZGFD government website. Interested elk hunters should contact us as soon as possible. We will assist potential hunters who will be booking with us. You will be placed on a contacts list to receive instructions for applying with our recommended hunt numbers. Arizona has a bonus point system which increases your odds of drawing a tag. Each time you are not drawn for a particular species, you receive a bonus point. If you are not drawn, you will be refunded the tag fee but the Arizona Game and Fish will keep the hunting license fee and give you a bonus point. It will give you a better chance of obtaining a tag for the next year's draw. Bonus points are becoming an essential part in successfully drawing Arizona elk tags. Choose a "Hunter to Guide Ratio" of either 1-on-1 or 2-on-1. The 1 on 1 rate means one hunter per guide. The 2 on 1 rate means two hunters per guide (share a guide). If choosing 2 on 1, you must bring the other hunter to share the guide with. Fully Guided Elk Hunts Include: complimentary tent camp accommodations, meals, transportation in field while hunting only, a guide, trophy prep, packing out animal, and up to 6 days hunting (3 for cow). Choose a "Hunter to Guide Ratio" of either 1-on-1 or 2-on-1. The 1 on 1 rate means one hunter per guide. The 2 on 1 rate means two hunters per guide. If choosing 2 on 1, you must bring the other hunter to share the guide with. **Guide-Only Hunt is our reduced rate option primarily suited for the elk hunter who only needs a guide and is not interested in the amenities. In addition, the elk hunter must provide their transportation, their camp/accommodations, supplies, meals, etc. Residents usually provide their own camp. Non-residents can stay at the closest hotel (if feasible) and meet in the field daily or bring their own camp. This option allows the guide to focus on only one thing: assisting the hunter in harvesting a bull elk. The guide will scout the area prior to the hunt and recommend where to set up camp or which area hotels to book (if feasible). Accommodations: We use a Southwestern Style outfitter tent camp which is often located many miles from civilization. Sleeping quarters for big game hunts are typically in deluxe outfitter tents, unless noted otherwise. A trailer often serves as the kitchen/mess hall where hunters gather to eat. If you are looking for a hunt with fancy lodges, this is NOT the hunt for you! Tent camps are used because we stay in remote areas. The deluxe tents consist of either large outfitter Kodiak canvas or Alaknak tents. The size of our tents are tall and spacious inside; typically 10X10, 10X14, or 12x12 and stand 6.5-9 feet tall. The tents are equipped with heaters during the colder months. Cots with thick pads are provided, but all hunters must bring their own sleeping bags. For those that choose the "guide only" option can bring a camping trailer to stay in, but we cannot discount the "fully guided" hunt any for bringing one. It must be high enough for ground clearance on rough dirt roads. Please ask for road conditions before bringing one. Video of our typical camp. Elk are usually found in rugged mountain areas. Hunters are encouraged to condition themselves to the best of their ability in order to increase their odds for success. We do not use or own horses and pack animals. If you are looking for a horseback hunt, this is NOT the hunt for you. For those serious about booking a hunt, the first step is to apply for the draw during January-early February. Contact the outfitter for assistance with the drawing process. You will be subscribed to our newsletter, which gives instructions on when, how and which areas to apply. If you draw a tag, a minimum 50% nonrefundable deposit is required to book the elk hunt. The remaining balance is due at least 21 days prior to the hunt. We recommend cancellation insurance for all of our guests. Visit our policy page for more details. Non-Hunter Fee: Some hunters like to bring along a buddy to camp and share the experience while they hunt. 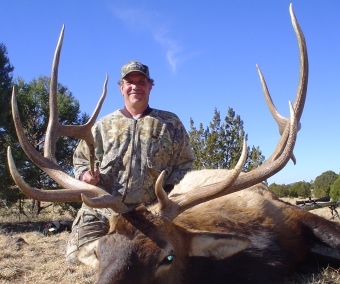 Invite someone as an observer while on your fully guided bull elk hunt for a fee of $950.00. The cow elk hunt observer fee is $750.00. Space is Limited. Based upon Availability. Costs and Considerations that are the hunter's responsibility: Licenses and tags, rental car, butchering, shipping of meat, taxidermy, hotel stay before/after the hunt (if flying). Gratuity for your guide is gladly accepted and is customary (15% is typical). * Hunters must arrive in camp one day prior to hunting. Your hunting ends around noon on the last day of the hunt. Hunters pack up and depart shortly thereafter. So, it's best if flying non-resident hunters arrive in Arizona the evening prior to meeting us (two days before hunting), rent a car from the airport, get a hotel room and we will meet the next day about noon in the hunt area. Flying hunters can follow us to camp in their rental car. Flights should depart the morning after the hunt, since travel time from camp to the city could be lengthy. We hunt many areas across the State for elk. Therefore, depending upon which area you draw, a specified meeting spot and time will be arranged prior to the hunt. Our elk areas are about 2 to 4 hours from the Phoenix Airport or 4 to 5 hours from the Tucson Airport. These are the only major airports in Arizona. More details on the general info page. Mike Vargas with a nice bull elk that he shot during the late muzzleloader season. 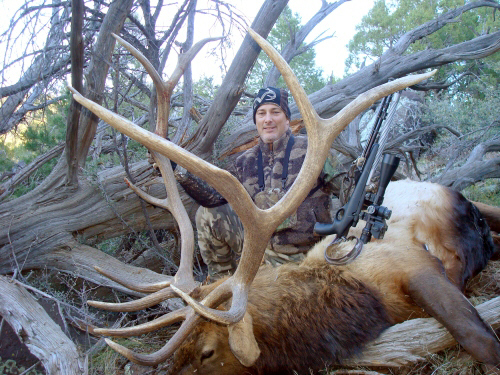 This giant early Muzzleloader Season bull elk was shot with a .50 caliber T/C Omega. 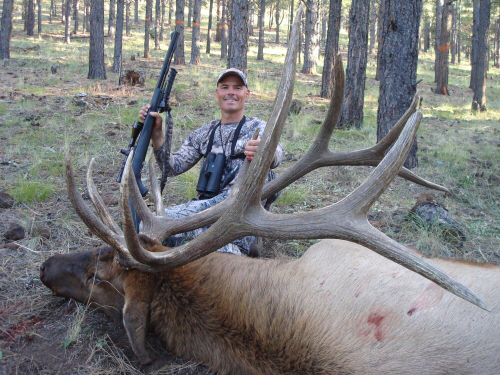 Anthony Ransom shot this giant Arizona bull elk with a scoped handgun at 246 yards! Freaky long sword points! Guide Pat Feldt and hunter Dan Rorbach with a nice archery bull elk taken at 43 yards. Eric Danowski from Michigan with a great Arizona Bull Elk. Guide Pat Feldt called this bull and his herd into 40 yards. 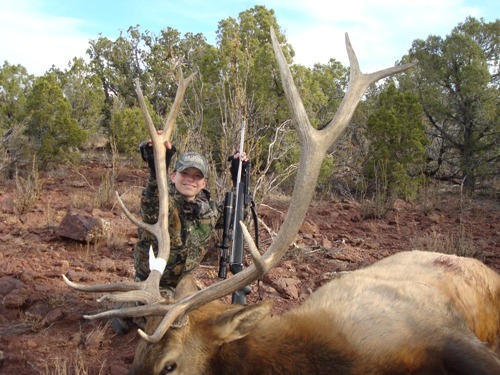 Twelve year-old Michael with an Arizona 6X6 bull elk that he shot at long distance using a .300 WSM. 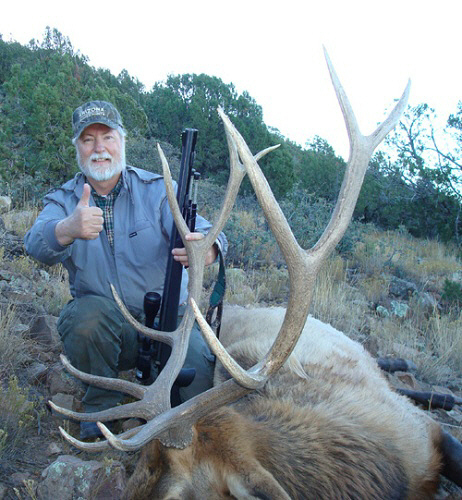 Ed Maddux with his Arizona 6x6 bull elk taken at 239 yards during the late muzzleloader season. Be sure you visit our general info page to learn more about our operation.